Xiamen Air made its first flight to Davao City from Xiamen, China landing at 7:05 p.m. at Davao International Airport, with 80 Chinese and Filipino-Chinese tourists on board. This marks the beginning of the Xiamen-Davao-Xiamen direct flight to the south. As soon as the Xiamen Air touched down the Davao Airport runway, airport firefighters pumped water onto the plane as a ceremonial salute for a safe flight and to welcome the visitors. Pomp and fun further welcomed the passengers at the arrival area of the Davao Airport with local artists performing cultural dances. Although the flight was delayed for six hours due to bad weather across the Taiwan Strait, the Department of Tourism in Southern Mindanao was buoyant for the successful Davao-Xiamen flight giving a boost to Philippines-China bilateral relations. Xiamen Air will return to Xiamen from Davao with already 40 passengers. A second flight will be made on Oct. 5. While it is still under limited-time service, Xiamen-Davao-Xiamen will have two flights a week if prospects remains bright. 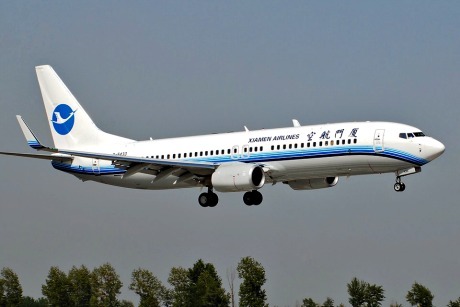 Xiamen Air is operated Xiamen Airlines Co. Ltd which was established on July 25, 1984 jointly by the Civil Aviation Administration of China and Fujian Provincial Government. XiamenAir was honored with the title of "The Best Airline In Mainland China" for 6 consecutive quarters in the "Airlines Service Survey" made by CARNOC.com. It is also known as the only Chinese airline featuring an all-Boeing fleet, Xiamen Airlines has a fleet of 143 aircraft with a total of 20,555 seats, and an average airplane service age of 5.61 years, as of September 2015. The arrival of Xiamen Air in Davao highlights the World Tourism Day celebrated globally aimed at instilling to the international community the significance of tourism in the country’s economy under the Duterte administration. Xiamen Air joins Singapore Airlines in offering international direct flights to Davao. Currently, Singapore Airlines serves the Singapore-Davao route twice a week. The Philippines remains one of the top destination choices for Chinese travelers because of the country’s beaches and islands and friendly and hospitable Filipinos. Eden David of DOT XI noted that the Chinese are the third largest tourists visiting Davao every year. Earlier, Tourism Secretary Wanda Teo noted a decline in Chinese tourist arrivals after the international tribunal ruling on the West Philippine Sea but is slowly trending upward.